Estate planning determines how someone's assets (their property, money in bank accounts, et cetera), also known as their estate, will be distributed after that person dies. This can be done through a will, a living trust, a charitable remainder trust, a life insurance trust, or other methods that can avoid probate and reduce taxes after death. Estate planning is an important consideration for everyone. Without a Will, the State of Washington could determine who gets your property when you die. To make sure that you make the decisions about the distribution of your estate, you need a will and/or a trust. Be sure that your property goes to the people you want it to by executing a Will and keeping it current. If you have recently married, had a child or have been divorced, it is critical that you have your estate plan reviewed to ensure that it accomplishes what you intend and that it protects your loved ones. Probate is the process whereby the Will of a deceased person is presented to the court and deemed valid or invalid, the instructions contained within are followed and the financial estate of that person is closed. 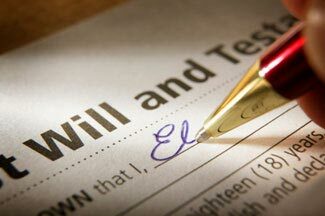 Once the validity of the Will has been proven to the satisfaction of the court, the property can then be distributed to the heirs in accordance with the terms of the Will. If a party dies without a Will, the laws of the State of Washington will determine who gets that persons property. Contact our office today for a free consultation regarding your will, trust, estate and/or probate questions, (360) 755-0111.